A sensual massage is a full body massage that helps release tension and stimulates the senses. Massage helps relax muscles throughout the body, soothes headaches, improves the work of the immune system, helps increase circulation and is excellent for brain functioning. Not only that, but massage has been linked to improvements in the nervous and digestive systems and is also recommended for overall optimum health. Our Facials are a skin treatment that cleanses pores, exfoliates away dead skin cells, and treats common skin concerns with a custom mask. This multi-step process is meant to rejuvenate and nourish faces, making skin appear healthier and younger. It is also a popular spa treatment to pamper and relax, right up there with a massage. A lot of clients talk about facials and at Kabuki we talk about skin treatments and the difference is clear. 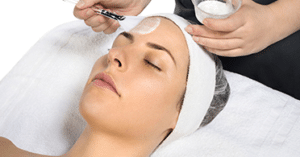 A facial is something that is indulgent or pampering. A skin treatment is specific to that client’s skin, designed specifically for them by an expert skin therapist and the results are unequaled. We start with our unique Face Mapping where we analyse the skin in depth and design a treatment that’s different every single time because your skin is different every time you come in. You should receive a Dermalogica skin treatment about every 4-6 weeks or as I often like to say, once every epidermis which is your outer layer of skin. The results your going to see with a Dermalogica skin treatment are unlike anything else in the industry because we exfoliate the skin, we double cleanse the skin, we do extractions, tailor-made customised massage and masque technique. With the products that are unequaled, you’re going to see your skin glowing, more luminous, hydrated, quite honestly it’s going to be in its optimum condition, the best skin you’ve ever had. Exhale at Kabuki Adelaide with a relaxing Massage or Facial in our indulgent Spa rooms. We believe a complete salon experience should include the opportunity to relax, be pampered and leave with a rejuvenated mind, body & Skin. For a complete salon and day spa experience, call Kabuki Hair on (08) 8272 1175 or book online. Kabuki Hair is a modern salon and day spa experience. Our hair expertise doesn’t stop at hair cutting and styling – Enjoy a relaxing beauty treatment with one of our professional Beauty Therapists. Combine your salon experience with a mani-pedi. We want you to feel pampered and gorgeous. Complete your new look with an expert spray tan! We use only premium quality spray tan, professionally applied. We use Vani-T spray tan for no orange tones, long lasting, even fading, authentic cocoa brown colour, no telltale odour, intense hydration. For the ultimate Beauty enhancing treatment, finish your Kabuki Hair experience with our Vani-T or Signature Glamour make-up, and leave looking spectacular. For that special occasion or just for a colour match pop into Kabuki Adelaide today to chat to one of our amazing Make-up artists.